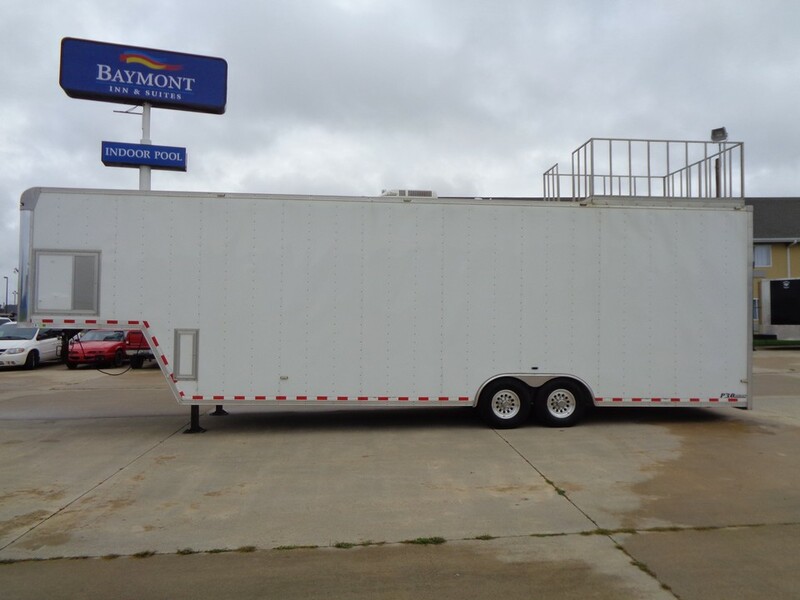 2010 Cargo Express 36 Ft Race car trailer with all the options! This trailer is loaded and ready to go to the races. It is the extra extra tall model, so a Sprint Car will go in easily. It has two winches, one for pulling in your car, and one for raising the rear door. The trailer has a set of tool boxes, side cabinets, extra cabinets, Ramp Overs, Stainless steal rear door, exterior lights, Alloy walk on roof / Observation deck with fold down railing, Air conditioning, 50 AMP fuse panel, Dual quick disconnect tire racks (one not pictured) spare tire, Alloy wheels, and air compressor that is plumbed to the back hose reel. I am sure there are things I am forgetting. This trailer pulls great for as big as it is. The body has a few rock chips and a couple dings, but for a 8 year old trailer it is VERY nice. We previously had a clam shell couch up front the was easily accessible with the steps to the front elevated level. It makes a nice area to relax and enjoy the races. We have recently installed all new LED lights. 18 New LED lights in fact!!! This trailer is super bright inside, and is very easy to work out of even at night. With the all new lights being LED the draw on the generator is only slightly more that the three original florescent lights were. The two rear facing Outside lights are very bright and make working on your car at night much easier. The trailer will include the air compressor mounted under the side cabinets. It is plumbed to the hose reel in the rear.